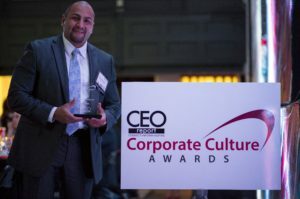 The CEO Report Corporate Culture Award distinguishes companies that foster a creative and collaborative workplace culture to enhance performance and sustain a competitive advantage. Rockville, MD – February 21st, 2018 – Shapiro & Duncan is proud to announce that it has been recognized by The CEO Report during their 2018 annual awards ceremony at the Blind Whino South West Arts Club in Washington D.C. for our continuous dedication to creatively cultivating and developing a successful culture in a collaborative fashion. The award ceremony championed companies who work harmoniously with employees to develop a positive and productive work environment. Shapiro & Duncan’s corporate culture is driven by an uncompromising commitment to superior performance. Five corporate values drive our mission and path to our vision and they are: Our People Perform; Our People do the Right Thing; Our People Take Pride in Their Work; Our People Drive Innovation and Our People Serve the Community. Our people are the center of what we do, and how we treat them is critical. We value our employees’ contributions and foster an atmosphere of mutual trust and respect. Education, training and career development are a win-win for Shapiro & Duncan. Clients benefit from educated and experienced professionals who can complete the job right the first time and deliver a high quality product on-time and on-budget. Implementing a culture of employees who are current on best practices, yields repeat business and referrals. “At Shapiro & Duncan education and training isn’t just important, it’s vital. In-house training and courses offered by outside organizations assist employees with their career development and it leads to an increase in their performance. The company’s education and training initiatives affect employees’ productivity in a very positive way.” – Jesus Yactayo, Senior Human Resources Generalist at Shapiro & Duncan. Our employees advance their careers through many avenues including taking advantage of our tuition reimbursement policy as they pursue their Associate, Bachelor and Master degrees. We provide paid education and training in trade apprenticeship programs, paid internships, external venues and and in-house classes through S&D YOUniversity. This year, Shapiro & Duncan has a record number of 66 apprenticeships enrolled and has 13 employees taking advantage of our tuition reimbursement program. Shapiro & Duncan fosters a collaborative environment filled with community service days, team building, networking events, friendly competitions, lunch with owners/managers, happy hours, employee discounts, sporting events, annual holiday parties and summer picnics. As a family business, the company promotes work/life balance, team member wellness, social engagement, and community service. Employees are rewarded for years of service and exceptional performance through bonuses, incentives and their “Employee of the Month” recognition program. All of these elements combined make for a solid company culture which helps keep our retention rate so high. 36% of employees have been with the company for over ten years and 21% have been with us more than five years.